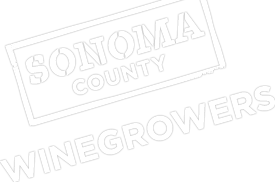 Over three hundred and fifty grape growers, industry and Commission sponsors participated in the Commission’s annual summer event at SRJC Shone Farm on June 5th. The agenda touched upon many topics near and dear to growers and featured a lively tradeshow with 46 sponsor vendors and agencies. The speakers, topics and friendly atmosphere overwhelmingly received two thumbs up in anonymous evaluations from attendees. The presentations kicked off with SCW President Karissa Kruse on “Why Marketing Matters to Grape Growers.” This was a look at how Sonoma County growers benefit and receive value from the Commission’s programs and activities as supported by the growers’ assessment dollars. Kruse’s presentation was followed by a grower panel sharing testimony on the value of the Commission and SCW’s marketing efforts. The panel was comprised of: Mike Rowan of Wine Creek Vineyard, Lise Asimont of Francis Ford Coppola Winery and Cameron Mauritson of Mauritson Family Winery. Both presentations were highly rated in the anonymous evaluations returned. Next up were: Dr. Thomas Harter of UCD on Drought, Groundwater and the Groundwater Management Sustainability Act in Sonoma County; Ag Commissioner Tony Linegar with Regulatory, VESCO, EGVM, and Pesticide Regulation updates, a Riparian Corridor Overview, and Water Board Waste Discharge Requirements; CAWG President John Aguirre with Federal and State legislative updates which dovetailed nicely with Harter’s and Linegar’s presentations. The event ended with the presentation of the Viticulture Award of Excellence presented to Kirk Lokka for his many volunteer services to the community and to growers. Kirk is a partner in Emeritus Vineyards and has an amazing and varied history of volunteer work and successful fundraising for non-profits. Supported by his wife, Debbie, and one of his two sons, Riggs, Kirk received a Resolution from Fifth District Supervisor Efren Carrillo on behalf of the Sonoma County Board of Supervisors. Kirk also received a Resolution from Assemblymember Marc Levine. Congratulations, Kirk, on an award well-deserved and overdue! Plaques were presented to the outgoing SCWC Board Members and the newly elected Board Members were announced. The tradeshow hosted 46 Commission sponsors who showcased an array of products, services and equipment. We thank them for their continued support of the growers and the Commission. Lastly, it takes a dedicated group of grower volunteers to ensure that the event runs smoothly. Please support the sponsors that support you! Growers Circle Sponsor: American AgCredit; and Platinum Sponsors: Vineyard Industry Products, Ag Unlimited, Bank of the West, Wilbur-Ellis, Central Valley Builders Supply. For a full list of sponsors, please see the attached list below. Lastly, we’d like to thank our volunteers for they are the heart and hands that keep the wheels turning: Vicki Michalczyk, Rich Howell, Lyle & Karen Hatten, Joan Patrick, Erin Yolo, Mike & Lynn Rossman, and our newest volunteer, Kylie Dutton.